Religion in Britain after the Reformation was remarkably unstable and places of worship were the focus of dispute and regular change. 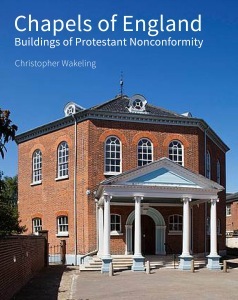 This book is the first substantial synoptic account of Nonconformist church architecture in England and aims to provide a history of Nonconformist architecture, using existing buildings wherever possible. It includes examples from the 17th century to the present day, covering all parts of the country and each of the main religious traditions within Nonconformity. The range and varied nature of the architecture is illustrated with new photographs of both interiors and exteriors. 7. 1890–1914: The Nonconformist heyday? Historic England is to be congratulated upon this beautifully produced and illustrated volume in which many of the striking photographs are drawn from HE's own archives. Dr Wakeling's expert knowledge of the subject is displayed to excellent advantage as he describes the development of chapels in the context of the religious and political circumstances of the times. Overall this is a compelling volume, which will be a valuable reference point for future scholars of English Nonconformity and religious architecture in general. ... Wakeling offers a rich study, which cautions against attempts to make generalisations about English Nonconformity. ... With its engaging illustrations, 'Chapels of England' successfully unpacks the architectural complexities of these diverse movements. ... a clear, wide-ranging, and nuanced account of dissenting architecture in England, from the beginnings to today. ... Christopher Wakeling's fine book, lavishly illustrated, clearly written, and underpinned by deep research, brings the story up to date, with a good selection of 20th-century chapels in styles from expressionistic Gothic to modernist. It does an excellent job of bringing all these buildings and the religious motivation for constructing them to life, illustrating their best points, and delineating some sort of pattern to the complex story of nonconformist architecture, a story that is also one of heterodoxy and variety. ... Christopher Wakeling's text balances understanding with clarity; and is illustrated by new colour images by a crack team of photographers at Historic England. Together, text and images make for a must-have volume for anyone interested in the topic. 'Chapels of England' provides the most comprehensive and authoritative overview to date of English Protestant Nonconformity's places of worship ...Wakeling's fine book take the buildings and synthesises his rich knowledge of both architecture and Nonconformist history and theology to review and explain individual buildings, the wider contexts from which they arise, and the broader patterns of which they are part. ... a beautifully illustrated scholarly account of the patterns of chapel buildings amongst all branches of nonconformity from separatist, pre-ejection times up to the twenty-first century. ... it is a tremendously impressive guide to what is a complicated and diffuse subject. ... but the whole book is an impressively thorough examination of the development of different styles of buildings as theologies changed, as denominations developed, as political circumstances evolved and as economic opportunity came and went. ... Historic England should be commended for producing such an impressive book, it is destined to become an essential publication for anyone with an interest in this aspect of religious history. ... heroic publishing milestone: ... The book and the endeavour deserve a medal for no previous work has begun to approximate to its comprehensive coverage, the lusciousness of the photographs, the authority of the scholarship and the delicacy of the English. This long awaited volume is ground-breaking in many ways, not least in carrying the story of non-conformist churches and chapels into the 20th century and beyond, moving beyond the usual charming Quaker meeting houses, Unitarian and Methodist chapels and mission halls in industrial towns. The first chapter provides an excellent introduction to the history of nonconformist worship in Britain, highlighting battles for worship space in parish churches between those of different religious persuasions. ... This book is an eye opener to an otherwise little-recorded subject and Dr Wakeling, former President of the Chapels Society, has certainly produced the definitive book on the subject. ... It is a truly magnificent book with chapters arranged chronologically from the reformation down to the present day. ...Historic England deserves high praise for commissioning such a distinguished scholar and presenting his informative analysis in such an attractive form. It deserves a wide readership.